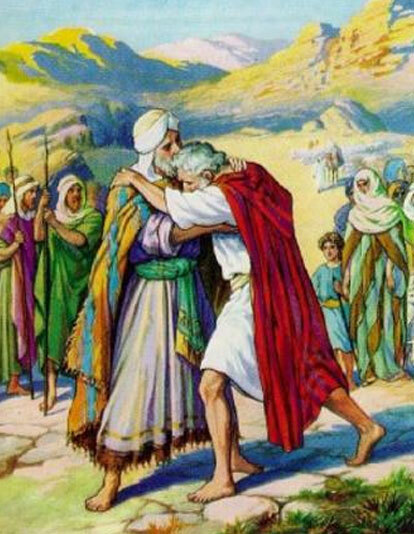 Chapter 31 47 And Laban called it Jegarsahadutha: but Jacob called it Galeed.48 And Laban said, This heap is a witness between me and thee this day. Therefore was the name of it called Galeed;49 And Mizpah; for he said, The LORD watch between me and thee, when we are absent one from another.50 If thou shalt afflict my daughters, or if thou shalt take other wives beside my daughters, no man is with us; see, God is witness betwixt me and thee.51 And Laban said to Jacob, Behold this heap, and behold this pillar, which I have cast betwixt me and thee:52 This heap be witness, and this pillar be witness, that I will not pass over this heap to thee, and that thou shalt not pass over this heap and this pillar unto me, for harm.53 The God of Abraham, and the God of Nahor, the God of their father, judge betwixt us. And Jacob sware by the fear of his father Isaac.54 Then Jacob offered sacrifice upon the mount, and called his brethren to eat bread: and they did eat bread, and tarried all night in the mount.55 And early in the morning Laban rose up, and kissed his sons and his daughters, and blessed them: and Laban departed, and returned unto his place. Chapter 32 1 And Jacob went on his way, and the angels of God met him.2 And when Jacob saw them, he said, This is God's host: and he called the name of that place Mahanaim.3 And Jacob sent messengers before him to Esau his brother unto the land of Seir, the country of Edom.4 And he commanded them, saying, Thus shall ye speak unto my lord Esau; Thy servant Jacob saith thus, I have sojourned with Laban, and stayed there until now:5 And I have oxen, and asses, flocks, and menservants, and womenservants: and I have sent to tell my lord, that I may find grace in thy sight.6 And the messengers returned to Jacob, saying, We came to thy brother Esau, and also he cometh to meet thee, and four hundred men with him.7 Then Jacob was greatly afraid and distressed: and he divided the people that was with him, and the flocks, and herds, and the camels, into two bands;8 And said, If Esau come to the one company, and smite it, then the other company which is left shall escape.9 And Jacob said, O God of my father Abraham, and God of my father Isaac, the LORD which saidst unto me, Return unto thy country, and to thy kindred, and I will deal well with thee:10 I am not worthy of the least of all the mercies, and of all the truth, which thou hast shewed unto thy servant; for with my staff I passed over this Jordan; and now I am become two bands.11 Deliver me, I pray thee, from the hand of my brother, from the hand of Esau: for I fear him, lest he will come and smite me, and the mother with the children.